Why is the Left so terrified of President-elect Donald Trump’s Health and Human Services Secretary nominee Rep. Tom Price? A paragon of rationality, well spoken, thoughtful, reasoning and respectful, they seem unable to answer his critique of runaway government on similar terms, so have turned now to fake news – or what, in any other country, would be called libel. This farce – venting of the mean spleen over facts and decent dialogue – must stop. In case you haven’t heard, the latest attack on Dr. Price centers on a hit piece done by the nation’s leading republisher of fake news, CNN. The character hit cries that Dr. Price sacrificed his reputation, career and principle to treat himself to a quick marginal profit. Specifically, the fake news crowd says he supported broad legislation that would benefit a specific medical device company in which he held stock. The story is completely untrue. It is as low as politics gets, and represents current barometric pressure of the Democrat storm on the Hill. To no avail, the Trump Team has demanded a retraction from CNN. Dr. Price remains solid as ever, even in this storm. With a background that spans Michigan Medical School, an Orthopaedic Surgery residency at Emory University, the practice of orthopaedic surgery for 20 years, and teaching resident physicians as an Assistant Professor at Emory University School of Medicine – all before getting to Congress – there can be no question why President-elect Trump nominated Dr. Price to lead HHS. The doctor is displaying, now, enormous patience – beyond his legendary command of medical, health care and policy complexities. 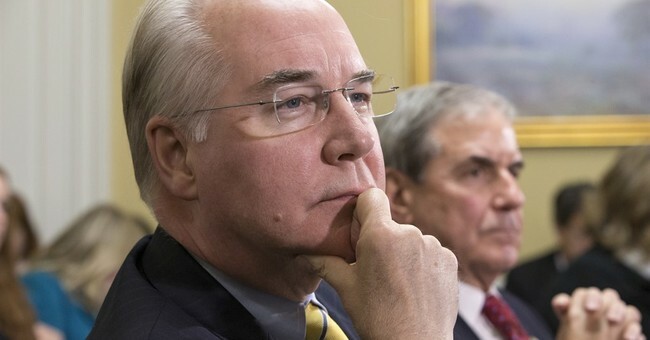 As a new head of HHS, perhaps no quality will be more needed – than patience. Why such a reflexive attack by the Left on Price? Why creation of a materially inaccurate, factually disprovable, and crude story about his motivations – which no one is believing, yet continues to circulate? Because Dr. Price represents all that the Left fears most about the Trump Team – he is competent, principled, clear-seeing, and undeterred by their threats and posturing. More, he knows their game. He knows how to end Obamacare and phase in a top-notch, solvent, premium support system for Medicare. If confirmed, Dr. Price faces a significant challenge in ensuring Medicare’s sustainability while providing quality care, but he has proven the depth to manage that transition, including deep familiarity with both government and free market patterns and practices. More than a worthy foe, his background is scary – because he knows exactly what of he speaks, from Medicare Part D to the presently strangled sector. That is exactly why Congress should be listening, not trying to silence him. Unlike the clamor from Senate Democrats and their allies, what Dr. Price suggests is not a voucher system. Rather, serving all Americans, his plan would permit competition for beneficiaries based on premiums, with the government contributing some percentage to lower coverage costs. The Price approach protects against any shock to the Medicare system by grandfathering those who might feel a disruption in benefits. Dr. Price is not reinventing the wheel here. He’s been representing Georgia’s 6th District since 2004 and was in Congress when Medicare Part D became effective in 2006. He has personally witnessed the success that robust competition brings to the prescription drug program. He is about results, responsibility, and integrity, and it is time that his candle be given a chance to light the way to better health care for all. One last specific: How successful is the Medicare Part D benefit, the model for what might follow? The Pharmaceutical Research and Manufacturers of America (PhRMA), an organization that promotes value driven health care, has data showing Medicare Part D to be both popular and highly successful during the past decade. According to PhRMA, which proffers the most widely used data, some 90 percent of seniors are content with prescription drug coverage that Part D provides. In fact, the average Part D premium was $32.50 in 2016, about one-half of what the Medicare Trustees projected. PhRMA’s data also shows that free market competition has driven down Part D’s costs to $345 billion or 45 percent less than initial 10-year projections. In other words, the structure of Medicare Part D is saving both consumers and taxpayers billions of dollars, while serving increasingly secure seniors. More to the point, Part D is actually helping patients to live longer and healthier lives. Since the program’s inception in 2006, nearly 200,000 Medicare beneficiaries have lived at least one year longer. The average longevity increase is 3.3 years. Does this not look like success? Let us then get on with it – and on with Dr. Price’s overdue confirmation. Beyond smart and practiced, Dr. Price is an intelligent, honorable man. He knows a solid foundation for a workable health care system, one that benefits all, is built upon America’s history, conscience and free markets. If positive revolutions, and efforts to restore sanity to this runaway bureaucracy, are about profound change – so be it. America is about getting back to basics, and restoring common sense, ethics and efficacy to the health care system. Dr. Price is the man to do it. And that is why the Left fears him so. He will not sacrifice reason, results or principle for title or evanescent benefit. He will change the system, and so – to those in the U.S. Senate: Confirm him now.